I have completed the outboard motor well, all enclosed volumes filled with foam. The bow decking has been sealed over the foam fill and the mast thwart has been cut and installed. 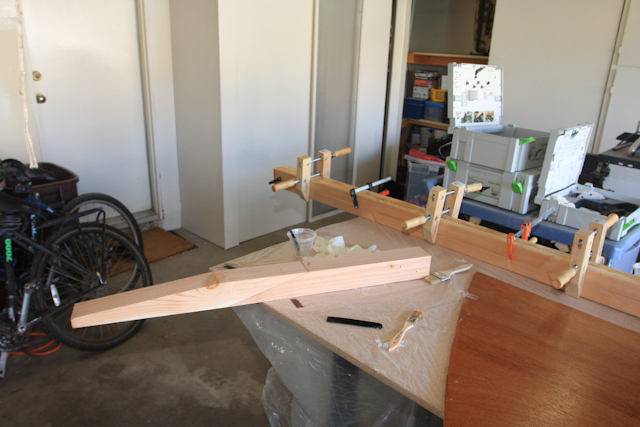 I also started to build the Bowspirt using scarfed 2/4 douglas fir. Bowsprit bitt, bowsprit, and fore deck. 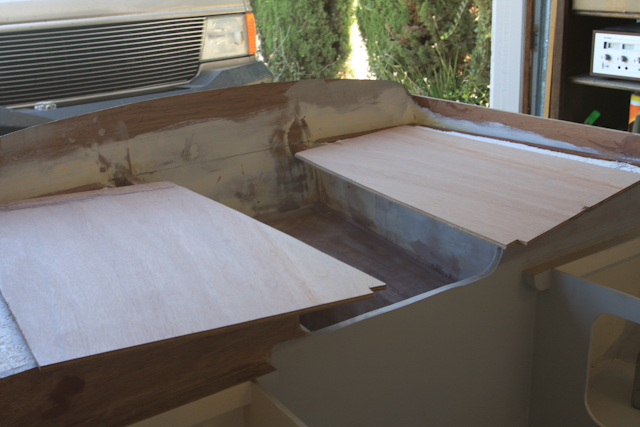 I played around with the previously completed floorboards to get an idea how the boat may look when completed. 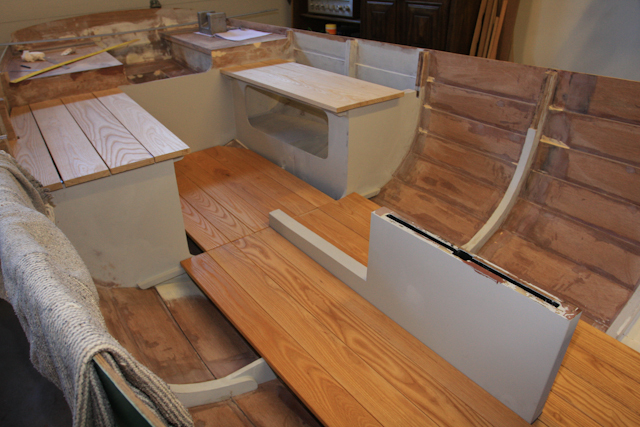 You can also see the completed aft decking and the initial fitting of the side seats. Jumping ahead to see what she may look like finished. As you know I’m not very good with English or French. I am building my ebihen while looking at your work. This works well for me, and I don’t make any attempt before you do. So it is good for me if you continue to put your construction plans and methods on your plans and methods on your web site. Congratulations! You have developed a very good way for air reservoir . Bu you haven’t put the picture of front air reservoir. How did you do it? I am stuck here. Because I was thinking to make the front gaff topsail as “Misainier” model http://img266.imageshack.us/img266/503/ebihen15.jpg As I understand, you are making the Gaff sloop sail plan, because you haven’t drilled the deck. What do you recommed me? Secondly, The designer specifies that first, you must cover the borde with polyester brait, then you must make primer, and then you must apply putty, finally you must paint it. But I haven’t seen you covered the borde with polyester brait or after painting you didn’t apply putty. Thirdly; How can I set the boat line fort he poisoned paint. Do you know any method for this? Meanwhile I got bored of sanding. First, Mustafa, thank you so much for responding and including a picture of your completed Ebihen hull. It is looking very good and I hope to see more photo’s of your work. It is fun to see another Ebihen being built at the same time as mine. As my “About Me” page indicates, I have no formal training with boat building and I am pretty much learning as I go. Some mistakes have been made but I have been able to recover from all of them so far. I am building the gaff/sloop version so my forward space is totally enclosed with sheet foam. I followed the same process for the rear enclosed spaces. I am assuming this is what you mean from your questions on the air reservoir. On your question concerning ‘cover the borde with polyester brait’. 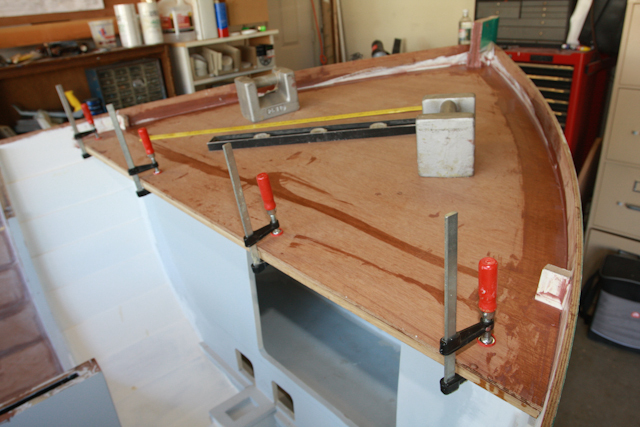 I did apply a strip of fiberglass along the keel and garboard strake along with the opening of the motor well. This is the only place I have used fiberglass on the hull. 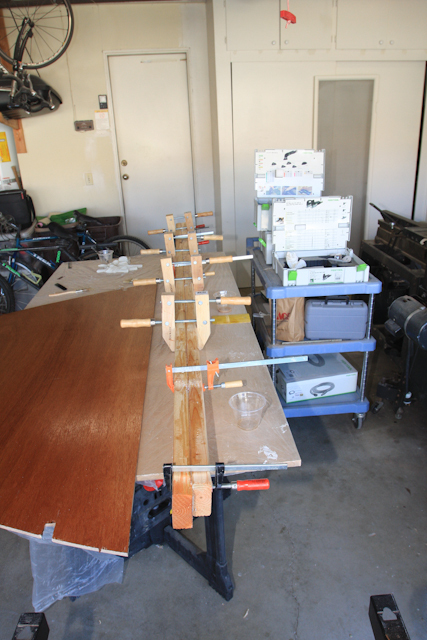 I used a batch of fairing epoxy along each board seam and sanded for a fair finish. I then painted or sprayed three coats minimum of primer to the entire hull, more sanding, and finally two coats of the green two part epoxy paint. I didn’t paint below the water line with anti-fouling paint as my boat will be stored on a trailer in my garage. I looked into how to mark the water line and several ways can be found through a Google search. In all honesty I simply chickened out on this step since it wasn’t necessary in my application. I hope to see more of your construction photo’s and feel free to email at any time.